Autumn overview of our center. The complex includes 5 rooms, among which: two double room, one triple room, one quadruple room, plus a special Wellness Suite. 40-m²-Suite complete with sauna, turkish bath, sensory shower, whirlpool bathtub in a private external area. 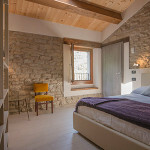 Double bed, two single beds, private bathroom, shower, private external area with solarium. Double bed, single bed, private bathroom with shower. Double bed, private bathroom with shower.